Halloween brings out the creativity in everyone, it seems. From wormy apples and ghost pops to bloody hands made with ice and eyeball candy. These flavorful deviled eggs are very versatile. They can be made with pimiento-stuffed olives as the eyeballs or regular ripe olives in the center. To make the whites look bloodshot, use bits of paprika, thinly-sliced pimientos, or roasted red bell peppers. 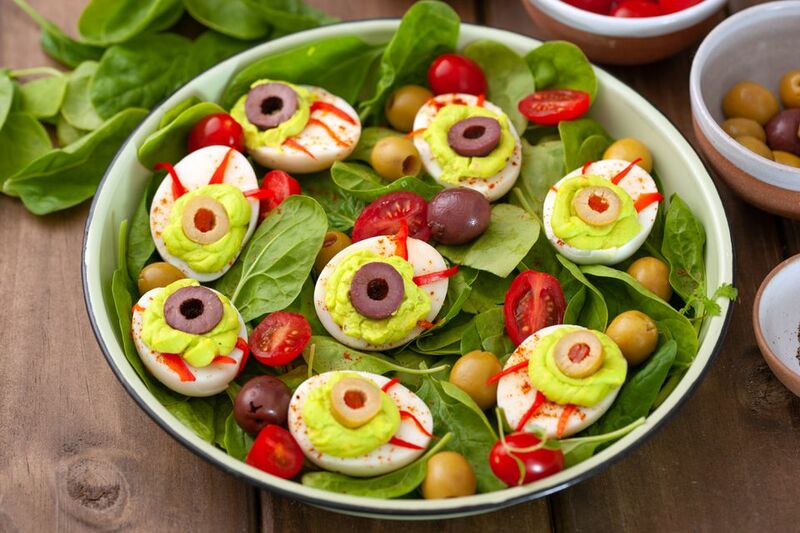 Green food coloring makes the eyeballs a ghoulish green, but feel free to use another color or leave them yellow. Put the eggs in a large saucepan and cover with cold water. The water level should be at least 1 inch above the eggs. Cover the pan, turn off the heat, and let it stand for about 17 to 21 minutes, depending on how much moisture you like in your egg yolks. Carefully pour off most of the hot water and place the saucepan under cold running water. Run the cold water over the eggs until they are cooled but still slightly warm. To peel the eggs, tap both ends gently on the countertop to break and then roll them gently under a hand to crack the entire surface. Starting at the wide end, peel the eggs under running water. Put the yolks in a bowl and place the 24 white halves on an egg plate. If you don't have an egg dish, spread some spring greens on a platter and arrange the eggs on the greens to keep them from wobbling. Mash the eggs in the bowl until smooth. Add 6 tablespoons of mayonnaise, 1 tablespoon of relish, and the mustard. Mix well and add salt and pepper, to taste. Add more mayonnaise and relish as needed for moisture and flavor. Mix a few drops of green food coloring into the eggs until the desired color has been reached. Blend well. Put the yolk filling mixture in a pastry bag with a large round tip. Alternatively, cut a small piece of the corner from a plastic food storage bag; spoon the yolk mixture into the bag. Arrange the thin slices of roasted red bell pepper over the egg whites to make them look like bloodshot eyes or sprinkle the whites with paprika. Pipe the filling into the shells. Slice the olives in half crosswise. Sink each olive, cut-side up, into the center of the filling in each egg. Add olives, grape tomatoes, or other vegetables around the eggs, if desired. Cover and refrigerate until you're ready to serve and enjoy. Fresh eggs are actually harder to peel cleanly, so try to find eggs that are within about 1 week to 10 days of the expiration date on the carton. For more filling in each egg, boil two extra eggs. Discard the extra egg white halves or add them to the yolk mixture and mash well.